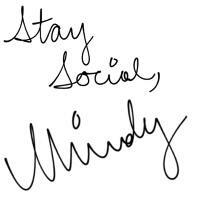 Welcome to the first post in a series of social marketing tips. These are going to be quick little tidbits of advice that can be easily be applied to your business social media pages. This first one is a little heavy, but I feel it’s a really important subject to discuss. 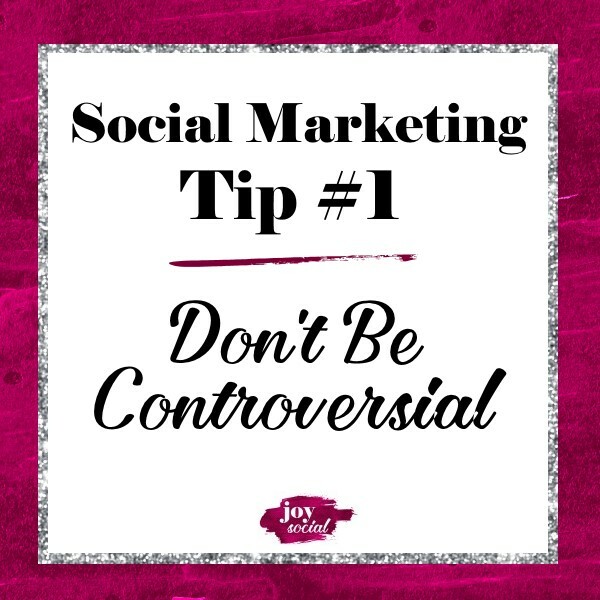 In a social media world, it’s very easy to get wrapped up in conversations that may not be conducive to your goals as a business owner. You probably don’t need me to tell you that topics like religion and politics should be handled with care. Religion can be a tricky one, because I know a lot of people make their faith a primary part of their business. If this is important to you, then by all means continue to do so. I know a lot of women and men who run thriving faith-based businesses, and they attract like-minded clients. But also be aware that having such strong opinions on any subject matter could potentially alienate you from some people. If you want to cast your business net as far and wide as possible, remain neutral on controversial subjects. 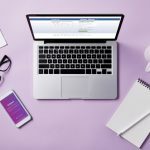 While this might be easy to follow and remember on your business pages, you may also want to think before you post on any profiles you consider private, such a personal Facebook page. 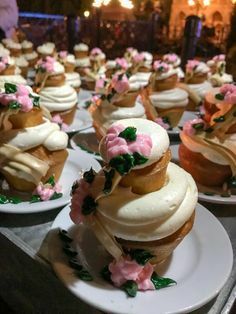 Sharing an unpopular opinion, even if you think it’s in a private and safe place, could be seen by business associates who might think twice about referring you in the future. 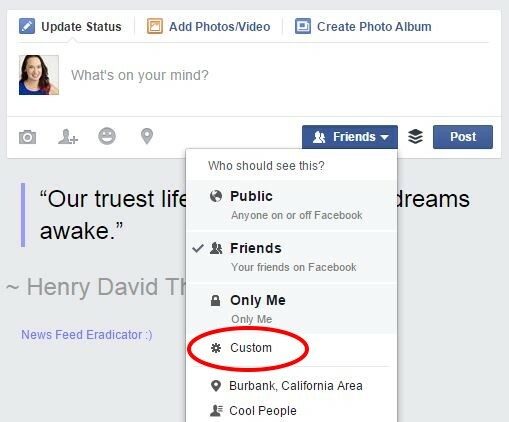 If you want to discuss personal and controversial matters on your personal Facebook profile, consider setting up a friends filter using the steps below. 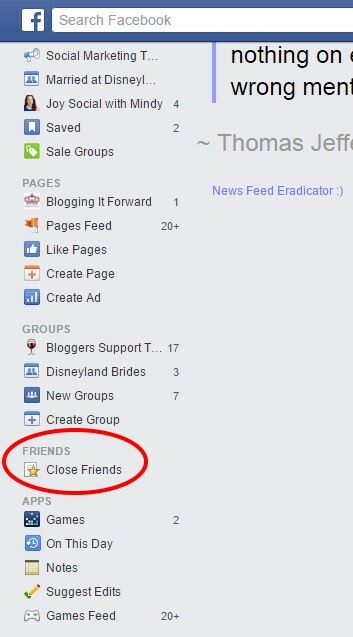 Step 1: On your main Facebook page, scroll down the menu on the left hand sidebar until you see the section for “Friends.” When you hover on the word “Friends” you should see a link that reads “More” – click on this. Step 2: You should now see your current Friends lists. Click on “Create List” in the top right corner. 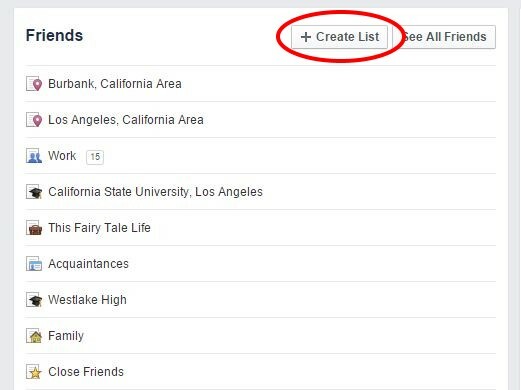 Step 3: A new screen will pop up where you can create a List Name and add friends to the list. Remember, you are making a filtered list of specific friends who you’re okay with seeing certain posts. This won’t be a permanent filter, but something you can select when you want to. 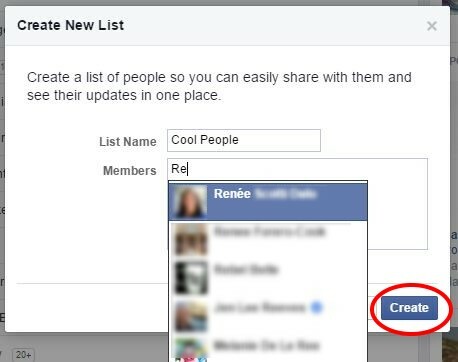 For this example, I created a list called “Cool People.” To add people to the list, simply start typing their name. 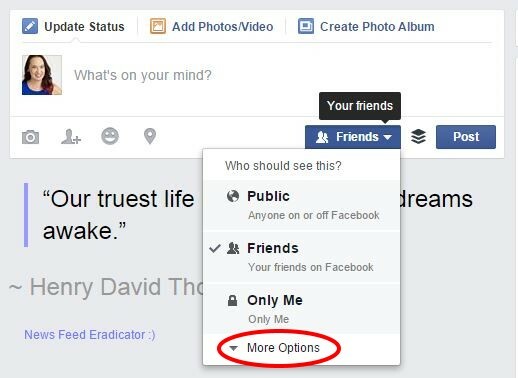 Anyone in your friends list who matches the name will appear the in the dropdown. Just click on the correct person and they will be added. If you change your mind or add someone by mistake, just click the little “x” next to their name to remove them from the list. When you’re done adding friends to the list, click on the blue “Create” button. Step 4: When you’re ready to post something on your personal profile, go to the “Update Status” window and select the button that most likely reads “Friends,” right next to the “Post” button. Your button may also default to “Public;” it depends on your settings. But most people have this button defaulted to “Friends.” Either way, this is where you set your privacy filters, so go ahead and click on that. When you do, you’ll see a small dropdown with “More Options” at the bottom. 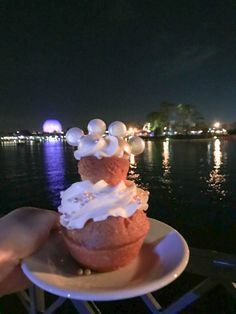 Click on that. Step 5: After clicking on “More Options,” the list will expand and you should see the new friends list you just created. If you select that list, your post will only be shown to that list. You can also EXCLUDE lists from seeing your posts. I know a few business owners who like to befriend their clients on Facebook, but don’t necessarily want them to see every single thing they post. 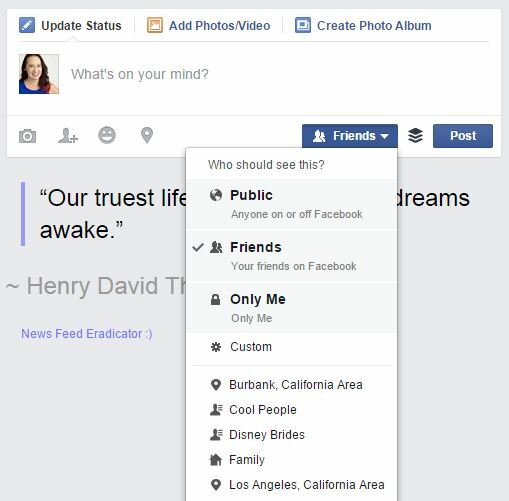 In this case, you can create a list of friends, and then set your privacy filter to exclude this list from seeing your post. 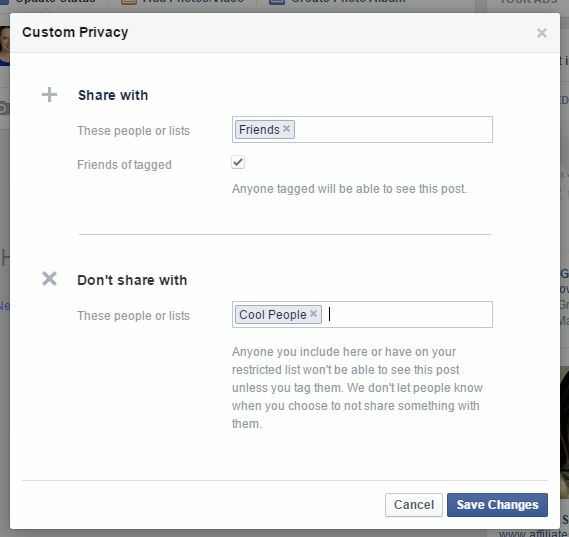 To do this, click on the privacy button, select “Custom,” and then in the “Don’t share with” section, type the name of the people or the list you want to exclude from seeing your post. Of course, the easiest solution is to simply stay off Facebook … but that’s easier said than done, isn’t it? The #1 thing to remember about the Internet it is, it’s never truly private and whatever you share could potentially come back to haunt you! And this is especially important to remember when you use the Internet and social media to market your business and brand. If you have any additional questions about privacy settings on Facebook, please leave a comment below or reach out to me. 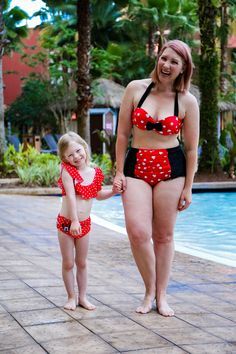 I’m happy to help! Are You Missing Out on Messages?